'Badges? We don't need no (stinking) badges!' So declared Mexican bandit Gold Hat (Alfonso Bedoya) in The Treasure of the Sierra Madre. He clearly wasn't an AV fan. We all love badges. And there's no shortage on Epson's latest projector, the EH-TW7400: 3LCD, 3D, 4K Enhancement, HDR and Pro UHD. The latter is a new one on me. But that's fine. The more the merrier. One of two new Epson models so anointed (perhaps optimistically, given that they're not native 4K), the EH-TW7400 is the entry point for this new appellation, and a replacement for last year's lookalike EH-TW7300. Built around Epson's stock-in-trade 3LCD image engine, this projector offers more brightness and greater contrast than its predecessor. It claims a dynamic contrast ratio up to 200,000:1, and uses pixel-shifting wizardry to present a 2160p image. The projector is also able to read HDR10 metadata, although as with all beamers, particularly at this price point, there's a limit to just how much it can do with it onscreen. The model is larger than Epson's current EH-TW6700/6800 Full HD series, so don't plan on using one for impromptu screenings from a coffee table. 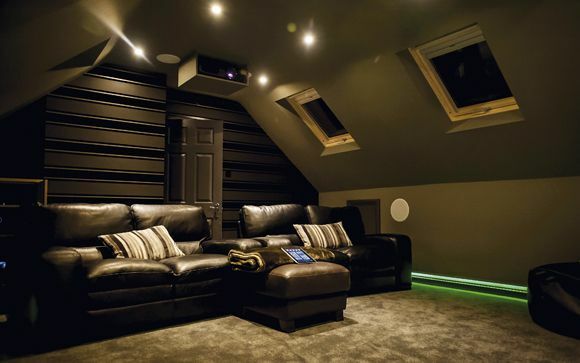 It's unapologetically about home theatre, and warrants a permanent installation. As we've come to expect from the brand, build quality is excellent. The matt white chassis features a centrally-positioned lens, with a flashy bronze accent, and cooling vents sit either side of the automated shutter. The backlit remote control is a standard Epson accessory; large but easy to wield in a darkened room. If you want on-body control, there are menu buttons hidden behind a sliding door to the side. Connections are recessed around the back. These include two HDMI inputs, but only one is blessed with HDCP 2.2 copy protection for use with UHD sources, which is a bit of a disappointment. Furthermore, 4K/60p 18Gbps transmission is off the menu too (it's reserved for the step-up EH-TW9400 series). Other connections are USB, VGA, RS-232C and Ethernet for pro use. A 12V trigger is provided for screen control. Motorised optics lend the EH-TW7400 a premium edge. A 2.1x optical zoom, powered focus and powered lens shift means you can line the image up and snap it perfectly into focus with just the remote. Generous lens shift options are +/- 96.3 per cent vertical and +/- 47.1 per cent horizontal. The throw ratio of 1.35-2.84:1 is also expansive. The PJ will cast images up to 300in, and you'll need a minimum projection distance of 3m to fill a 100in screen. For advanced theatre installs, there are ten memory slots to store different screen aspect ratios. Getting to grips with this Epson is fairly straightforward. In addition to the usual tabbed text box menu, seen on countless Epson projectors previously, there's a Home button which presents a fully graphical screen detailing source inputs, with shortcuts for auto iris, display presets, power and menu. The brightness rating is a punchy 2,600 Lumens, suggesting making this capable of use in rooms with some levels of moderate ambient light (although for the best results, it deserves full light control). Lamp life is also impressive, while obviously down on the laser/LED competition. Epson quotes 5,000 hours in Eco mode, saying this translates to a movie a day for seven years (give or take the odd blockbuster). Most vitally, image quality here is tremendous. I don't mind admitting that I'm a fan of 3LCD. Single-chip DLP projectors may have the edge when it comes to absolute sharpness, principally because there are no alignment issues, but 3LCD isn't subject to rainbow fringing, and colour fidelity tends to be excellent. Picture presets are Dynamic, Bright Cinema, Natural, Cinema and Digital Cinema. I found the Cinema mode a little too dull for most source content, but Natural, Digital Cinema and Bright Cinema all provide satisfactory jumping off points for movie and TV shows.